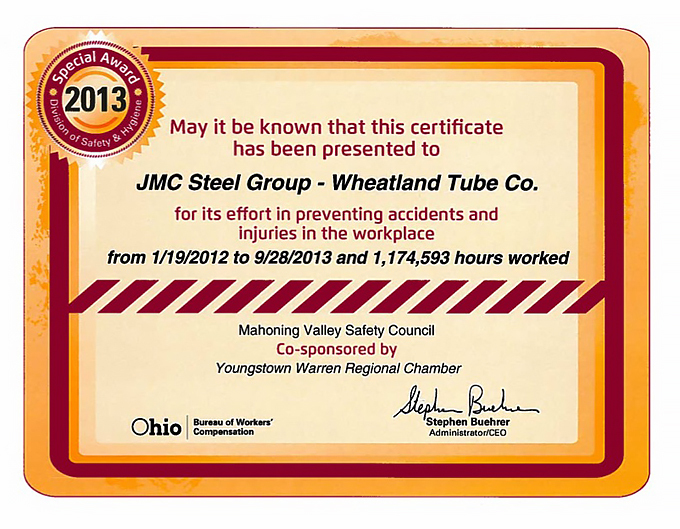 JMC Steel Group and Wheatland Tube were honored at the Mahoning Valley Safety Council’s Annual Safety Leadership Award Luncheon on Wednesday, May 14. Wheatland Tube’s Warren and Niles facilities were recognized for their effort in preventing accidents and injuries in the workplace, receiving the “Special Award.” The Special Award is given to employers that accumulate at least 500,000 hours and at least six months without an injury or illness resulting in a day away from work. Human Resource Manager, Denise Carissimo, accepted the award on behalf of JMC.